A few days ago I received a fabulous package in the mail and today I will share the contents with you. 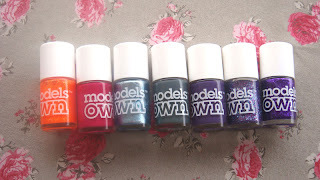 I've been wanting some Models Own nail colours for quite some time now so after seeing the fabulous colour selection and great deals on their website I decided to place an order. My order arrived really fast in a pretty and tidy package. Some colours were for friends so I will present to you only the colours I got for myself. From left to right the colours are Orangeade, Foxy Fuschia, Blue Moon, Moody Grey, Pure Purple, Disco Mix and Purple Haze. All swatches are two coats without top coat. 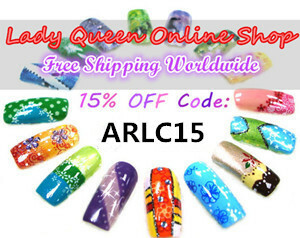 I was very pleased with both the customer service and the nail polish quality and I will definitely be ordering again. Do you have any Models Own products? What is your opinion of them? You got a great selection of colors! I have some MO from swaps and like the polish though the cap feels awkward to me when I'm painting with it. I don't have any of their glitters--yet. I ordered some polishes last summer (nice CS) and so far I'm very happy about polish quality and colors. Now I'm just wearing Moody Grey, wonderful!! These are gorgeous!! I'm in love with Moody Grey and everything to the right of it. And no, I don't own any Models Own. nice haul! Love the colors! ^_^ thank you for your comments ladies. 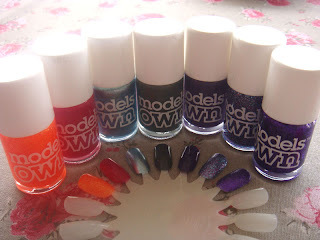 I have to admit I am itching to get more colours but for the time being I want to try these beauties on my nails first. :) I'd love to see how these look on nails! I love the little bottles and have been wanting to get some MO's for myself! I don't have any Models Own as of yet, but I want to! :) I can't wait to see your swatches!